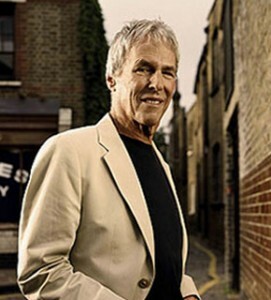 Burt Bacharach is renowned for being one of pop music’s most acclaimed, chart-topping composers & producers for over four decades. He has won multiple Oscar and Grammy awards, and he has written an astounding 48 Top 10 pop hits, including nine songs which reached #1. Now at age 77, Bacharach could have already retired as one of the all-time greats. However, he remains a vital and creative music force, and his new album At This Time (which will be released Nov. 1 on Columbia Records), is one of his most ambitious, innovative works to date. At This Time is unique in two, significant ways. 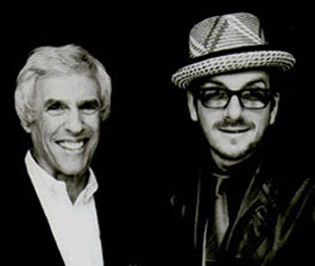 It marks the first time Bacharach has written the lyrics for his songs, teaming up with hit writer Tonio K. to create all the lyrics for this album. Bacharach was inspired to write lyrics which are often topical or political, to express his indignation with the current U.S. administration, and to reflect upon the state of the world and society today. Secondly, At This Time is cutting-edge from a musical standpoint. The album comprises musical pieces which have more free-form, unorthodox structures. Instead of typical pop-song formats, Bacharach has created an adventurous, liberating approach, where he uniquely intertwines different music segments and vocal passages into cohesive music pieces. Notably, the new album features contributions from a diverse group of top artists, including Elvis Costello, Rufus Wainright, Dr. Dre, and trumpeter Chris Botti. Costello and Wainright perform lead vocals on separate cuts, and Dr. Dre contributes drum and bass loops on three of the songs. At This Time also includes lead vocal performances by John Pagano, Josie James and Donna Taylor. For Dionne Warwick he co-wrote (with lyricist Hal David): “Alfie,” “Walk On By,” “Anyone Who Had A Heart” (also a hit for Luther Vandross); “Don’t Make Me Over,” “Message To Michael,” “Trains And Boats And Planes,” “I Just Don’t Know What To Do With Myself,” “I Say A Little Prayer” (also a hit for Aretha Franklin); “(Theme From) Valley Of The Dolls,” “Promises, Promises,” “Do You Know The Way To San Jose,” “This Girl’s In Love With You,” “I’ll Never Fall In Love Again,” and “You’ll Never Get To Heaven (If You Break My Heart)” (also a hit for the Stylistics). Other hits written by Bacharach & David include: “What The World Needs Now Is Love” (Jackie DeShannon); “Raindrops Keep Fallin’ On My Head” (B.J. Thomas); “(They Long To Be) Close To You” (the Carpenters); “Baby It’s You” (the Shirelles) ; “Only Love Can Break A Heart,” “The Man Who Shot Liberty Valance,” “Twenty-Four Hours From Tulsa” and “True Love Never Runs Smooth” (Gene Pitney); “(There’s) Always Something There To Remind Me” (Sandie Shaw, Naked Eyes); “What’s New Pussycat” (Tom Jones); “The Look Of Love” and “Wishin’ And Hopin'” (Dusty Springfield); “One Less Bell To Answer” (Fifth Dimension); “This Guy’s In Love With You” (Herb Alpert); “Magic Moments” (Perry Como); “Any Day Now” (Chuck Jackson); “Tower Of Strength” (Gene McDaniels); “Make It Easy On Yourself” (Jerry Butler); “Blue On Blue” (Bobby Vinton); “Wives And Lovers” (Jack Jones); and “My Little Red Book” (Manfred Mann). Burt Bacharach with Elvis Costello. In addition, Bacharach co-wrote the following hits with Carole Bayer Sager: “That’s What Friends Are For” (Dionne Warwick, Elton John, Gladys Knight & Stevie Wonder); “Arthur’s Theme (Best That You Can Do)” (Christopher Cross, co-written by Cross and Peter Allen); “Heartlight” (Neil Diamond, co-written by Diamond); “Making Love” (Roberta Flack, co-written by Bruce Roberts); and “On My Own” (Patti LaBelle & Michael McDonald). Bacharach has been the recipient of many major awards, including three Academy Awards: Best Song for “Raindrops Keep Fallin’ On My Head” (1969); Best Song for “Arthur’s Theme (Best That You Can Do)” (1981); and Best Score for Butch Cassidy & The Sundance Kid (1969). He has also won six Grammy awards: Song Of The Year for “That’s What Friends Are For” (1986); Best Original Score For A Motion Picture for Butch Cassidy & The Sundance Kid (1969); Best Pop Collaboration with Vocals for “I Still Have That Other Girl” (with Elvis Costello, 1998); Best Score From An Original Cast Show Album for Promises, Promises (1969); Best Instrumental Arrangement for “Alfie” (1967); and The Trustees Award (with Hal David, 1997). 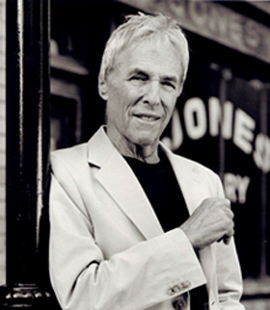 Here is the Q&A interview with Burt Bacharach. He was very pleasant to speak to, and he spoke very passionately about his new album. DK: When did you first conceive the idea for At This Time? Bacharach: I was talking with Rob Stringer (head of Sony/BMG Music U.K.), who was in Los Angeles for a Sade concert at the Hollywood Bowl. I told him I wanted to make an album. He was interested, but he wanted me to try something more adventurous and cutting edge — not your typical 10-song pop album for radio. It appealed to me to make a cutting edge album. I also liked the idea of working with a record exec who was willing to take some risks. DK: How did you hook up with Dr. Dre for this project? Bacharach: I was introduced to Dr. Dre by Steve Lindsey (a hit publisher & producer). I met with Dre, and we talked about doing an album together. He gave me seven drum & bass loops to work with. They were four-bar loops. I took them home and experimented with them, writing to the drum and bass lines. The album project with Dre didn’t evolve, but I did use three of the loops for At This Time, including ‘Go Ask Shakespeare’ (featuring vocals by Rufus Wainright). And check out “Danger” on the album – it’s pretty adventurous. DK: Musically, the album is more experimental. What was your vision for creating this album? Bacharach: I wanted to do something that was different and experimental, not your typical song structures. In fact I don’t call them songs — they’re musical pieces or adventures. These musical pieces do not have typical verses or choruses. For example, I would bring in a voice for eight bars, but it wouldn’t necessarily follow a song pattern. I was just writing like I feel. I would hear a phrase in my head, and I would just go with it. I’d say, “don’t bring in one voice, bring in three voices.” Or have a voice just come in for eight bars. I had the total freedom to create these musical pieces exactly as I heard and envisioned them. DK: For the first time, you’ve written the lyrics (with Tonio K.) for your album. What inspired you to write these lyrics, which are more topical and political? Bacharach: I had to express myself lyrically, in addition to musically. All my life I’ve written love songs, and I’ve been non-political. I didn’t march against Vietnam. So it must be pretty significant that I suddenly have strong feelings of discomfort with the state of the world, and what our (U.S.) administration is doing. There are obviously many people who feel the way I do — I’m not traveling a road by myself. I just have problems with this administration from top to bottom. There were things that I needed to say on this album. It was time for me to ask, ‘who are these people who are taking control of our lives and how do we stop the violence?’ I’ve got two little kids and a 19-year-old son, and I wonder what they’re going to do with their lives. This is very personal to me – this is the most passionate album I have ever made. I believe this album is as good as anything I’ve ever done; I’m very proud of it. DK: Looking back on your great career, what are some of your favorite songs that you’ve written? Bacharach: “Alfie” is definitely a favorite. It’s a powerful song with a brilliant lyric by Hal David. It’s one of the best lyrics that Hal or anyone else has ever written. I really like “That’s What Friends Are For,” because of its connection to the fight against AIDS. I also love “What The World Needs Now” and “A House Is Not A Home.” Aretha Franklin just recorded a wonderful version of this song for the Luther Vandross tribute album. And I really liked the songs I wrote with Elvis Costello, such as “This House Is Empty Now” and “God Give Me Strength” (from the Painted From Memory album). DK: Have there been certain cover records of your songs, which stand out for you? Bacharach: There have been so many terrific cover records. One that comes to mind is the great version of “I Say A Little Prayer” by Aretha. This was a better record than the one I produced. DK: Lastly, do you have any advice for young songwriters, who are trying to break into the business? Bacharach: My advice to young writers, is to get a sense of music theory. Learn how to write music down, and not just sing it into a tape machine. Be able to hear it in your head and write it on a piece of music paper. The more you do it, the more comfortable it becomes. Also, get away from your instrument sometimes. When I’m writing my feeling is, let me get away from my keyboard. Get some perspective — hear where it goes and when it feels right. Know where the drums and the other instruments should come in. Try to hear the whole song. If you’ve got a great eight bars, they try to figure out the next eight bars. See how it goes emotionally. Learn how to write music, learn harmony, and learn where the notes are.